In a world blasted by twitter storms, one fears it is difficult to hold any voter's attention for longer than 140 characters. But the Nov 6th election is critical and so attention is deserved especially in Florida, where "Red Tide Rick" Scott is trying to unseat incumbent Bill Nelson. For eight years Rick Scott has served as a governor of Florida. During this time, we have gotten to know virtually nothing about the man. The public record is clear enough: he is very wealthy. His public disclosures do not accurately capture his assets. He lives in a mansion in a secluded Port Royal section of Naples. He thought well enough of this isolation to support a new law restricting the rights of Floridians to public beach access. Still, from the low tide line if you peer closely enough, it is relatively easy to see that Rick Scott's embrace of crony capitalism not only enriched him personally while in office, it is having massive impacts on the balance between federal and state interests where the outcome is defined by what major campaign contributors want. I'll get to these in a minute. Scott's fortune derived from skirting the edges of federal health reimbursement regulations. He narrowly escaped the indictment that encumbered his business with the largest civil fine ever levied at the time; about $1.7 billion. Scott claims his assets are in a "blind trust". While governor, his net worth has skyrocketed, including from lucrative private investments that may have been made through contacts he established while governor. 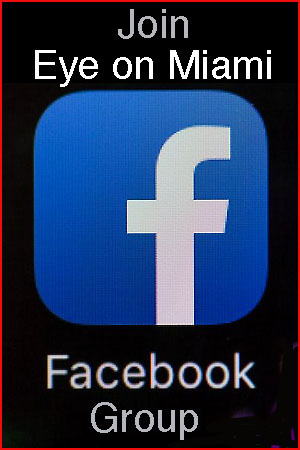 In July the Miami Herald reported that a single deal netted Scott more than $500 million. Since he raised the subject, it’s fair game. The giant hole in his rags-to-riches story is the $1.7 billion that his hospital company, Columbia/HCA, was fined for defrauding Medicare and Medicaid. Scott left the company with a golden parachute four months before the federal inquiry became public. He has claimed he had not known about its systematic overbilling and other frauds. Throughout his two terms, Scott has frustrated the intent of the Florida Constitution’s “full and public disclosure” requirement. On occasion, he has briefly disclosed the trust’s assets long enough to appear to comply with disclosure and to persuade the courts to dismiss litigation over the issue. He has always chosen the alternative disclosure that allows him to withhold his income tax forms and submit a statement of assets instead. In one of those cases, though, Judge Brad Thomas of the First District Court of Appeal warned that the law “may likely be incompatible” with the Constitution. You see, Rick Scott has excelled at a version of political life that has crystallized during the Donald Trump era: it doesn't matter what you do as a leader. What matters is what you seem. Rick Scott has seemed the role of governor without serving the public interest very much at all. His appearances are carefully staged and scripted. He abhors being captured on camera where critics somehow pierce the veil his team has created. He does not answer reporters' questions but sticks to talking points. He tightened down on public disclosure law in part to reduce his exposure to public scrutiny. The most common time to see Rick Scott is during weather-related emergencies. Then, he is all over cable television news, always wearing a Navy baseball cap, and seeming to be an expert on big storms. But in the aftermath, Scott is carefully hustled from place to place without giving journalists much of a chance to squeeze through the scrum. It's all gloss. It is all appearance. As an environmental leader I've had substantial exposure to the way Scott's top appointees -- his capos -- act in relation to Florida's significant environmental crises: ones that are imposing immense costs on citizens today like the blanket of toxic red tides threatening the state's tourism and real estate based business sectors. It turns out, contrary to his staff's assertions, Rick Scott is a micromanager when it comes to the environment. Here are few examples of his fingerprints. 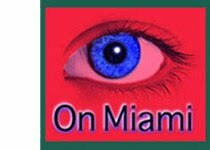 First, his appointees to the governing board of the South Florida Water Management District -- beginning with his decision to appoint Peter Antonucci, his personal counsel, as chairman -- were meant to strictly follow his guidance on the balance of interests between private industry (ie. campaign funders) and environmental resources. His guidance? To throttle civic and conservation voices plain and simple. Shortly after his first election in 2010 (he had never served in any elected capacity, before that time) Scott killed the deal to buy US Sugar and its 130,000 acres of land in the Everglades Agricultural Area. He not only killed the deal, he personally reached down into the staffing of the South Florida Water Management District and imposed massive cuts on the agency's science capacity. If you don't ask good questions of science, you will never get answer you don't want to hear. It was a key point of support of Big Sugar for his 2010 campaign, at a time when he had very few supporters beyond his investment advisors and the accountants who cut checks from his personal account to his campaign. Seven years later, the public got a "deal" for an Everglades reservoir that will cost at least twice as much as the US Sugar land acquisition would have. Its main benefits will not accrue to the environment. Will not relieve the damaged rivers and estuaries and Florida Bay. Its main benefits will be to provide guarantees of drought-protection for Big Sugar. Getting to this point, where taxpayer interests have been so baldly and badly damaged took a lot of work. Part of that load was carried by the political appointees of the water management district who routinely criticized, derided, and otherwise insulted members of the public and environmental groups trying to inject fact and science into the public arena. That's not what Rick Scott wanted. His order to ban agency staff from using the words, "climate change", is along that same line. So was his tolerance for governing board members' support of crisis actors, paid by the sugar industry through Roger Stone, to oppose environmental protesters at governing board meetings. One of Rick Scott's claims to environmental stewardship was his 2012 announcement of a state investment of $890 million in Everglades related protection and infrastructure. He never said, and mainstream media reports largely failed to report at the time, that the state was forced to invest at the point of a major loss in federal court. Even today, Rick Scott is appealing that decision alongside the Fanjul billionaires. And it is worthwhile understanding why his staff are appealing. Scott believes, with Big Sugar, that the federal court "overreached" in its decision supporting environmentalists and the Miccosukee Tribe, whose Everglades have been gutted by polluted runoff from sugar fields. The right to externalize the costs of pollution are considered, by Scott, to be allowable under states' rights. Period. 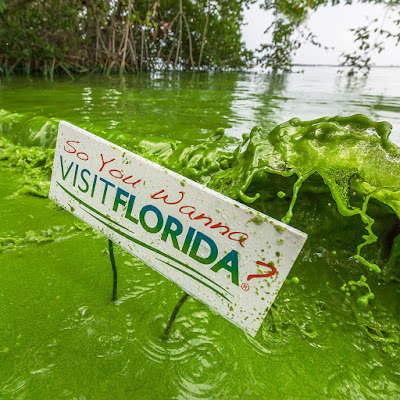 When Scott and the GOP state legislature, including electeds like Adam Putnam and Matt Caldwell (now running for Agriculture Secretary), condemned the effort by the US EPA to regulate nutrient pollution of Florida waters, they did so with the identical argument: leave us alone, let us pollute or regulate the way we want to. So there you have it: this is not a matter of "seeming" after all. As governor, Rick Scott actively and deliberately pushed for measures that imposed huge, even unlimited liabilities, on taxpayers. "Red Tide Rick" really is "Red Tide Rick". And he wants to be Florida's next US Senator. Floridians will see, on Nov. 6th, how that goes. Red Tide was recorded back in the 16th century and in the 18th century. Did he go back in time and do something? It's also been found in other countries. Was he there too? Give me a break. resulting death of birds and fish. de episodes begins and continues for 10 years. have resulted from red tide. ed-tide-infected shellfish is recorded in Florida.